The Altuğ and Behruz Çinici Archive, taken by the SALT Research Architecture and Design Archive last year, will be comprehensively studied during free film screening and panel sessions throughout the year starting today at SALT Beyoğlu's open cinema. The archive not only presents a detailed history of a long established architectural firm, but also allows architects, employers and other interested users to analyze the field of architecture in Turkey from 1960s to 2000s. The archive is currently being digitalized and cataloged at SALT Research. A film compiled from Turkish architect Çinici's speech recordings, focuses on his perspective on urbanization and architectural projects. 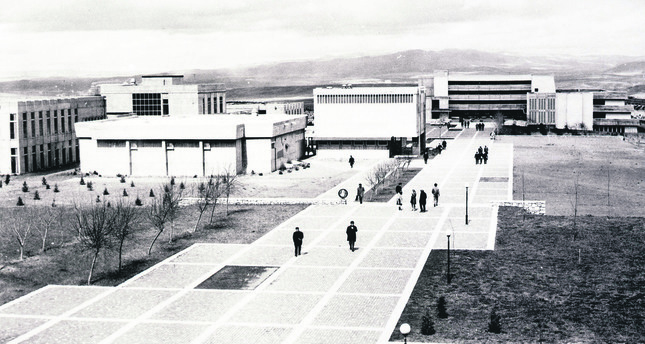 During panel sessions, Çinici's architectural perspectives will be discussed along with his design of the Middle East Technical University (ODTÜ) campus, one of his earlier works with his wife, Altuğ Çinici. Aside from events in Istanbul, a number of other sub-events will take place in Ankara this autumn to see how their office has evolved over the years. Since 2008, the content of the SALT Research Architecture and Design Achieve has gathered detailed resources on architecture in the 20th century in Turkey. Kalebodur, which previously supported SALT's environment exhibitions, is the only sponsor of the architecture and design archive this year. Resources can be found on the website saltresearch.org. Internships are also available to study in the archive during the summer months.